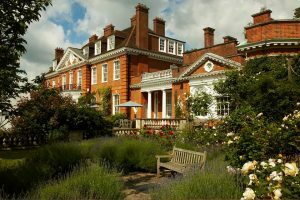 Nestled in 22 acres of peaceful landscaped gardens and Hertfordshire parkland, Hunton Park provides a romantic and versatile venue for weddings and civil ceremonies. The beautiful Queen Anne style Mansion House boasts a fascinating history stretching back to 1810. Offering a variety of licensed indoor and outdoor spaces, there is plenty of choice of settings for romantic vows and celebratory twirling. 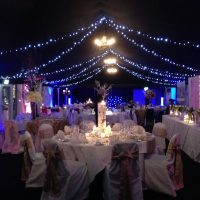 The dedicated wedding team at Hunton Park understand that every couple wants a unique and personal celebration that reflects their personality and tastes. Offering a range of customisable packages allows couples to express their creativity whilst enjoying the stress-free advantages of a set package. If you fancy extending your stay to prepare for the big day or to unwind following all the excitement, take advantage of the 61 comfortably appointed rooms. The Buttery Beauty Spa offers a full range of relaxing treatments and therapies or alternatively grab a towel and head to the indoor pool. The grand entrance to the Mansion House makes an impressive setting in warmer weather. Tall white columns flank the doorway and lead into a chandelier-lit room that is ideally suited for the signing of the register. 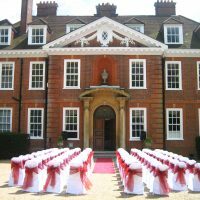 Accommodating up to 100 guests, the mansion becomes a grand backdrop to your memorable ceremony. 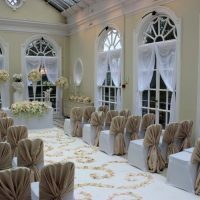 Neutrally decorated the Hazlewood Suite provides a blank canvas that will compliment your chosen theme and style. Catering up to 100 guests this room is perfect for larger gatherings. For smaller more intimate gatherings, the Orangery provides a sophisticated setting for up to 65 guests. This bright and airy room is bathed in natural light that shines through the French doors, glass vaulted roof and full-length windows that lead to the balustrade. The beauty of the Orangery makes it an elegant space that requires little adornment; ideal for thrifty couples. 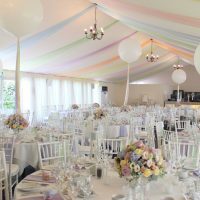 If you have more guests than confetti the Marquee makes a wonderful setting for receptions seating up to 150 for dinner or 250 for an evening celebration. Attached to the manor house with a covered walkway, the marquee enjoys panoramic views of the delightful gardens. Using locally sourced, fresh seasonal produce, the catering team are able to create a flexible selection of delicious menus that can be tailored to suit your requirements. To discuss your needs and options, please call 0871 222 4808 or take advantage of the online enquiry form on the website.